Tales of the TMNT Collected Book Volume 4 is now available for pre-sale at PanelToPanel.net. All copies of this book sold through Panel To Panel feature an exclusive bookplate with a new image of Raphael drawn by Jim Lawson and signed by Peter Laird, Jim Lawson, Steve Murphy, Dan Berger and Eric Talbot. The book is due to ship in mid-October. More pages from Eric Talbot's sketchbook. 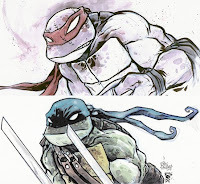 Eric Talbot has updated his blog with a series of new sketches, many of which contain Turtles. You can check out the sketches here, here, and here. Season 1, Part 2 of 4Kids' TMNT series is available on DVD today. Artist Andres Ponce shares with us a new page of pencils for a UK-exclusive TMNT Fast Forward comic story. You can check out this new art on Andres's blog. TMNT artist Diego Jourdan has launched his new Web site and with it he features three pages from the upcoming Tales of the TMNT #40. You can check out these pages here, here, and here. NinjaTurtles.com today posted this information about the recently announced deal with NECA. NECA, National Entertainment Collectible Association, has signed a license to produce and distribute collector's market TMNT action figures, statues, busts, weapon prop replicas and bobbleheads based on the TMNT comic books from Mirage Studios. These items will be avaialble to small independent retailers, independent toy stores, comic and hobby shops, and specialty chains. The design and development process has just gotten started, so prduct won't be available for awhile. We'll post news from the folks at NECA as soon as possible! Earlier this week, Steve Murphy posted to his blog NECA's first design sketch for these new action figures. Due to its lack of resemblance to any of the Mirage comic books, this design was rejected. 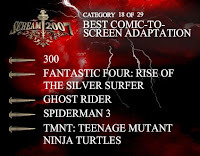 TMNT has been nominated for SpikeTV's Scream award in the category of "Best Comic-To-Screen Adaptation." You can vote here. It looks like you can vote as many times as you want! Thanks to raphaelprime for the link. “The Curious Case of Mr. Jones” - Casey Jones is interrogated by "Men in Black" after he and Raphael battled an alien robot that crash landed on Earth. Will Casey reveal who Raphael is to the secret agents? How was the mechanical menace from the stars defeated? And just who are these men of mystery asking all of these questions? All this will be solved and more in Tales of the TMNT #42! Welcome back to TMNT Volume 4! Well, not quite yet... but soon. Volume 4 is going to return this year, but in a slightly different form -- or forms, to be more precise. There will be an inexpensive -- or possibly free -- online form, as well as a more expensive limited edition collectible printed version. I was also getting frustrated with the time lag between finishing the book and actually seeing it appear before the eyes of the fans, on comic store shelves. It would very often be up to four or five weeks from the time we sent the materials to our printer. Again, not uncommon and completely reasonable -- it takes time to print, bind, trim and ship a comic book. So, while I was on hiatus, I started thinking about it, and came up with a new scheme. It may turn out to be harebrained, or it might be really good... or maybe just okay. We'll see. 1.) Digital Distribution: Each issue will be posted online at the ninjaturtles.com official TMNT website, within a few days (or maybe even hours) of being completed. Access to each issue will very likely be free to anyone with an internet connection and a decent browser, though I am looking into possibly charging a small fee... haven't figured that one out quite yet. In addition, if feasible technically, I may try something new for TMNT -- a somewhat interactive online letters page. I'm not completely sure how or even if this will work, but I'm mulling it over. 2.) Limited-Edition Printed Distribution: Each issue will also be printed in a "collectible" limited edition, very likely somewhere between 1000 and 3000 copies. These will be available via mail order from Mirage, and will probably cost $10.00 each, shipping included. The first hundred books ordered per issue will have an original black and white TMNT head sketch drawn and signed by me on the inside front or back cover. These print versions will almost certainly not appear at the same time that the online version is posted, but probably several weeks later. I'm hoping that these changes will work, and will allow me to continue doing Volume 4 with the same sense of fun which has sustained the book from its inception in 2001 up until the beginning of my hiatus in June of 2006. I think it's worth a shot... and I hope you do too! Artist Dario Brizuela has posted some preview pages from the upcoming Tales of the TMNT #38 to his blog. You can check out all of the pages here, here, and here. Tales of the TMNT #38 will be in stores later this month. KB Toy stores are giving away a pack of 4Kids trading cards free with any purchase. Each pack is the same and contains a card from most of the shows in their Fall lineup. The TMNT card features this art. 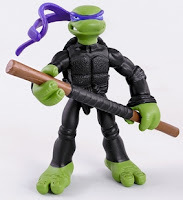 Toy News International has released pictures of new TMNT "Mini Mutants" toys and figures that will be hitting shelves in 2008. These figures are similar in design and scale to the Star Wars "Galactic Heroes" and Marvel "Superhero Squad" toys. You can view the entire gallery here. Thanks to IBNXuFasch for the link. The second half of Newsarama's interview with Kevin Eastman is now available for reading on their website here. This part deals mostly with Heavy Metal. Eric talbot has posted some scans of sketches from last weekend's Comic Expo in Toronto. You can check all of them out at his blog.